A very traditional Florida fruit gift that&apos;s been a favorite for many years. 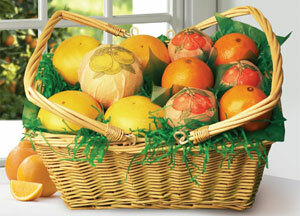 A classic, woven wicker "picnic basket" is filled with a premium selection of citrus. When the fruit is all gone, the basket can be used for packing a picnic lunch, of course, or for crafting, decorating or gardening. The Deluxe version includes three jars of tropical jellies and marmalades and rich, creamy chocolate-dipped coconut patties. Dee_lish! Sign up to be notified when Picnic Basket is in season. The Picnic Basket of Sunshine is available November to April to the US and eastern Canada. The Deluxe version is not available to Arizona, California, Lousiana and Texas due to USDA regulations. The Picnic Basket of Sunshine may be ordered packed with all oranges or mixed oranges and grapefruit. The deluxe version adds 3 jars of tropical marmalades and jellies and an orange blossom honey.